Even before I ever discovered Gunpla and the massive Gundam multiverse that accompanied it, I was still into some shape or form of mecha. My childhood revolved around Lego and Transformers – what I consider to be the precursors to my Gunpla experience, with the former covering the building and the latter covering the cool robot aspects. I was a rather spoiled child, so thanks to my gracious grandparents, I had amassed quite a collection as a kid. Amazingly enough, I still retain most of that collection, though admittedly much of it has already been sold off. Due to space issues (my current glass towers are already filled to the brim with my most modern collections) I’m unable to keep the relics of my childhood with me, but thankfully one giant glass display cabinet at my grandparent’s residence is all I need. Because one house isn’t enough to hold the full and massive extent of my geekery. As shown, the main display hold three shelves – two of Bionicle, one of Transformers. The lowest shelf is the largest, and therefore was relegated to the bulkier aspects of the display. The Transformers collection on the bottom is kept strictly to Armada – for the fact that Armada was my childhood, and I grew up watching it. I had a good amount of the toys as a kid, though they were pretty beat up. Thanks to this, however, I managed to snag a few new additions to the collection (Hoist and Unicron to name a few) as well as replace some of my older figures entirely (Super Optimus). The rest from that haul were generally sold off on eBay to turn a good profit. 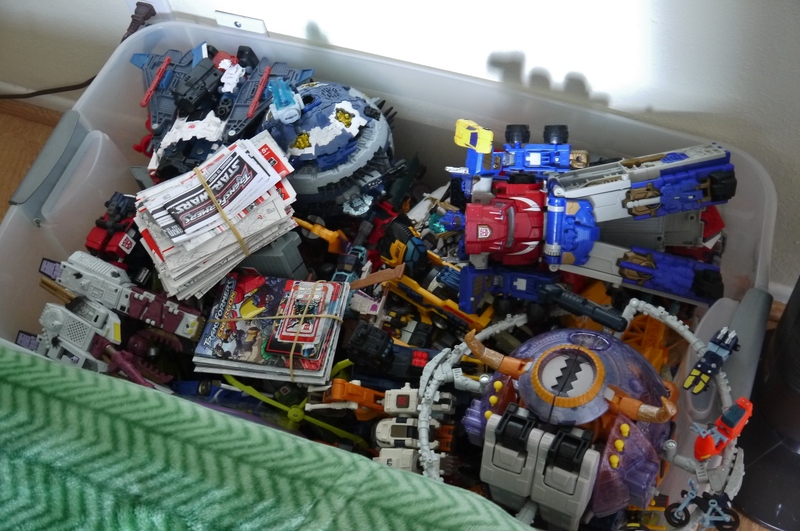 (And they were – everything from The Bin that we brought at the Swap Meet that fateful day has been sold, minus some Armada figures shown here). To this day I still keep an eye peeled for any Armada figures I currently lack – the most prominent ones being Hot Shot, Starscream, and Jetfire. It’s been a childhood dream of mine to assemble the entire animated cast that I grew up with. Thankfully the Armada figures aren’t too expensive nowadays, though it still runs over $100 to complete my collection if I bought ’em all off eBay at once. The mint Megatron above is another addition to said collection, that I acquired at Robo Toy Fest late last year. I was extraordinarily tempted to open it and replace my Galvatron in the cabinet with it (I don’t care for the Powerlinx recolors; would rather own the originals. Yeah, sorry Red Alert) but decided against it just because it was so rare to have a mint Megatron in packaging. I never cared too much for the mini-con expansion packs that were sold everywhere. For this particular collection I wanted to merely acquire the teams that could form into the three legendary weapons – the Skyboom Shield, Requiem Blaster, and Star Saber. I have the former two (sort of…the Requiem Blaster team is sort of missing a few parts) but the Star Saber seems to be extraordinarily difficult to obtain. Therefore I have the Energon Saber team there as stand-ins. Ah, the Bionicles…how much I loved this franchise. Probably more defining for me than the Transformers; I remember I used to dress up as Toa Vakama for Halloween all the time…though unfortunately mother dearest was too worried about a Dark Hunter attack to let me go out for candy. To give an idea as to how infatuated I was with the story and toyline: when I grabbed Bionicle: Mask of Light as a kid, I watched it every day for nearly two months – to the point where I could literally quote the entire movie off the top of my head. Mother dearest found it marginally disturbing that I impersonated a Rahi and Makuta Teridax within the same breath. As shown, the top row consists of the original Toa – the Mata and their upgraded Nuva counterparts behind them. Proud to say that I’ve had these ever since they first came out, and retained them in complete condition! I remember distinctly that my first Bionicle was Toa Mata Lewa (the green one in the front row). My grandmother had taken me to K.B. Toys in Broadway Mall, and she even helped me put it together since my hands were too tiny and weak to work with the ball joints. The second of the three rows has my personal favorite generation of Toa – the Metru. The Inika behind them are kind of random, but they were the most complete set I had to be displayed. I do have all the Hordika Toa (along with Roodaka, Sidorak, and Keetongu) but they’re in pieces at the moment. Too much of a hassle to dig through the big Lego bin to try to piece them together. I stopped collecting Bionicles around 2007 – my last complete set was the Barraki (a disappointing set if I do say so myself; the newer generations get too gimmicky and flamboyant – preferred the golden age of no-nonsense figures like the Metru and Nuva more). I didn’t stop following the story, but the toys got old. I still own almost every set up until Sea of Darkness arc, but some rare exceptions were made a little ways down the line. For one, the Titan-class Takanuva shown above was something that really piqued my interest – I loved Takanuva’s original set in 2003, so a reinterpretation of the character sized up in Titan form was a must-have for me. I remember really enjoying building a Bionicle again after a year or two off, but this was my last set before the final Stars in 2010. When Bionicle’s grave marker was erected in 2010 and the final Stars line was just about to be released, I decided to grab my final Bionicle set for nostalgia’s sake. As disappointing as the Stars were set-wise, it felt appropriate for the dying franchise’s last hurrah. The bottom of the glass display shelf is basically a storage of shame – old relics I either don’t have the heart to sell or are just too useless and old to garner much profit off of. I could probably make some profit off of that Super Optimus there, but it was one of my first Transformers as a child, so it holds sentimental value. The Optimus actually on display is in better condition, so my original is relegated to gather dust below. Yup, those are starfighters from Star Wars hanging down by fishing line. They’re actually Snap Tite Revell kits that I experimented with a while back. While they’ll probably never get an actual review on the site, they’re pretty decent as far as model kits go. I am actually quite fond of these kits, but unfortunately they do garner a good amount of dust (and cobwebs) hanging up there. Hence why I don’t hang anything on my actual ceiling. A closer look at the insanely detailed Y-Wing. Make no mistake, those panel lines weren’t inked for you on the kit – I did all that. 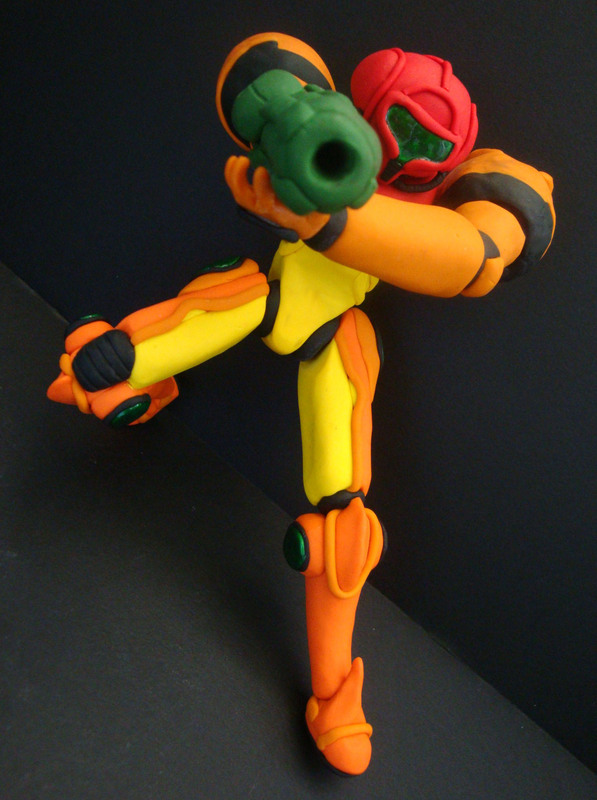 With a Gundam Marker. How I had that much patience, I’ll never know. These kits are pre-colored and don’t require anything fancy to put together. My two Jedi Starfighters. Before taking these photos, I had no idea Obi-Wan’s cockpit hatch was missing. No, I do not know where it went. The cockpit itself is pretty detailed though, eh? And there you have it. My childhood, preserved (kind of) to modern day. I have a feeling I could make a good amount of money if I sold all of these off, and given I don’t even see them often, they just sort of sit there as money left on the table. Either way though, sentimental value does occasionally have its time in the limelight, so this poor old collection will be spared the terrors of an eBay listing.